Chestermere resident Charlene Hart found her love of pottery, and joy of building objects from hand in the midst of a difficult time of her life. 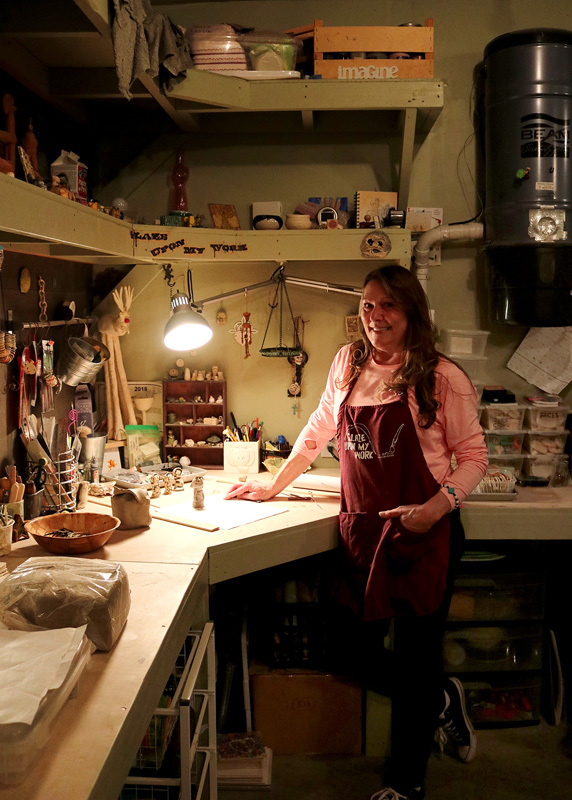 Hart went through a breakup ten years ago, and in an attempt to get her mind off of the things going on in her life she began attending pottery classes. While looking for classes, Hart came across pottery classes in which she would build objects from clay. She attended the classes for over a year, however, her passion quickly grew beyond the classroom. Hart would frequently create projects at home and bring them into her class. She ended up teaching students in her class how to make projects. “I ended up quitting the classes, and it took off from there,” Hart said. She added, “It helps to ease the stress of the day. If I’ve had a rough day, because I have a full-time job as well, I can come into the studio. 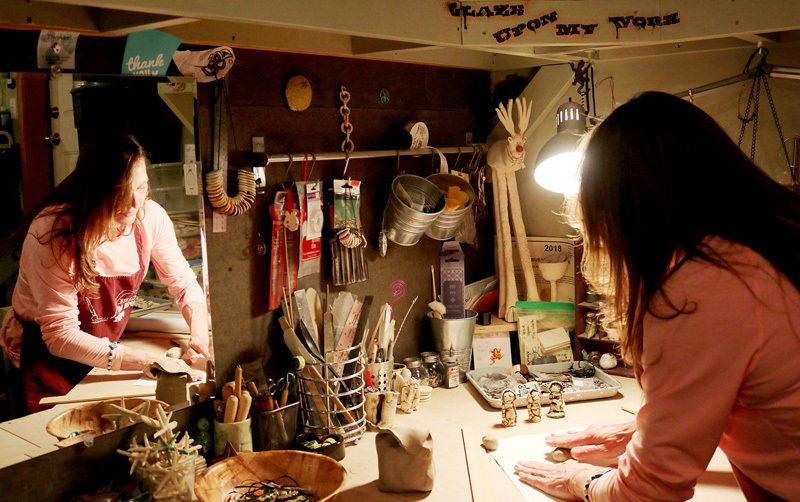 In addition to making her own art, Hart has begun teaching pottery as well. While making pottery relaxes Hart from the stresses of her day, she gets the most satisfaction from watching her students create a piece of art with their hands. “It’s all step by step, and seeing the kids blossom out and realize they are an artist, I love that,” Hart said. When Hart makes a pot, plate, ornament or figurine, it first begins with cutting a slab of clay and rolling it out. “From the slab, I have thousands and thousands of stamps, texture pads, everything and anything to put texture into that piece of clay,” Hart said. Once the slab of clay is rolled out, and any designs are added, the slab is transferred onto a piece of plastic, turned over, and placed into a mold. “I’m terrible for going anywhere now, because I don’t look at an item for itself, I look at the texture on the item and that’s why it’s purchased and brought in,” Hart said. “I have kids in the neighbourhood now when they get a new pair of shoes with a new pattern they run over here, ‘Char, we have a new pattern,'” Hart said. After the clay in the mold is completely dry, usually taking anywhere from two to 10 ten days depending on the weather and humidity, Hart bakes the object in the kiln. “If there is the littlest bit of moisture when it goes into the kiln it could explode,” Hart said. After the piece is fired the first time, it comes out like a rock, and is ready to either be glazed or painted. Hart can build figurines from a chunk of clay in a matter of minutes, or plates in half an hour, depending on how detailed the design is. “The satisfaction is knowing that I did that, I made that, and it is typically one of a kind. “Each piece is going to be individual and slightly different. I like the thought that this is something that could be around thousands of years from now,” she said. Inspiration will hit Hart anywhere, at any time. It’s not out of the ordinary for Hart to get an idea and quickly make a note of it and go into the studio later that day. “I do hike a lot, if I’m out in nature and I see something that catches my eye I will come in and recreate that. “Or just something that happens, I can come and create a memory,” Hart said. Hart has a friend that often said, ‘Do one thing, and do one thing good,’ however, Hart likes to do everything. “It all depends on what catches my eye,” she said. The walls in Hart’s studio are filled with photos of anything she finds inspiring, which she eventually will recreate in clay. For Hart, inspiration comes from things she sees, things she hears, or something someone mentions to her. “I had a friend that said she wanted a fairy garden to put into her yard, so I made her a fairy garden,” Hart said.